In 2014 we made a successful start to launching the Business Travel Network to employers across Bournemouth and the Three Towns Corridor area. 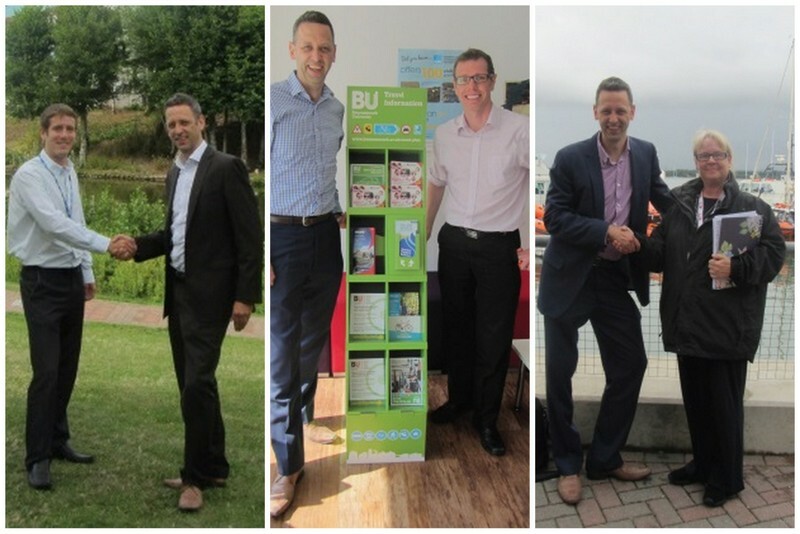 Within the first few weeks of engagement, Bournemouth University, Coleman Insurance, RNLI College, Royal Bournemouth and Christchurch Hospitals NHS Foundation Trust and Spectrum Housing Group became pioneering members of the Network and are now working towards achieving their Network accreditation by implementing a travel action plan to support staff travel to work. Pictured below from left to right are new members Steven Fall, Sustainability Officer at the Royal Bournemouth and Christchurch Hospitals NHS Foundation Trust, Richard Wintrip Travel Plan Co-ordinator at Bournemouth University, and Anna Frizzell, Sustainability Manager at the RNLI being welcomed to the Network by Jim Bradley, Business Travel Network Co-ordinator.